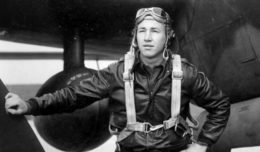 The National Advisory Committee for Aeronautics sent 13 engineers and support staff to California’s Mojave Desert in September 1946 to assist in the quest for supersonic flight. The X-1 aircraft represented the first U.S. Air Force designated “X” or experimental vehicle. It officially exceeded Mach 1 Oct. 14, 1947. Mach is measured from 650-750 mph depending on a number of factors such as atmospheric conditions and altitude. 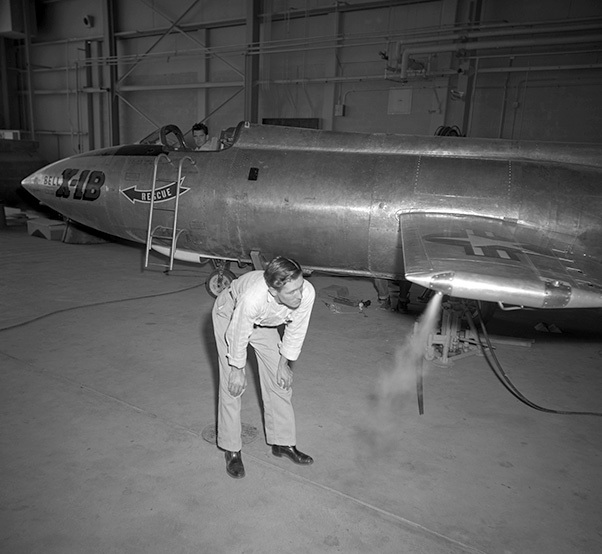 The NACA had its first supersonic flight, also on an X-1 aircraft, March 4, 1948. The small contingent of NACA, which became NASA in 1958, staff were expected to complete the single project and wrap up operations at the desert outpost. Now 70 years later, the NASA Armstrong Flight Research Center in California continues to test the latest aviation marvels through flight. A number of X-planes followed, designed to find answers related to speed, temperature, structure, control and human physiology, work that continued as the agency morphed from the NACA to NASA in 1958. One such aircraft was the X-15 rocket plane program that posted a then record 199 flights, including binders of research, and an official record of speed at Mach 6.7, or more than 4,500 mph, and an unofficial altitude record at the edge of space at 67 miles, or 354,200 feet. The X-1B reaction control system thrusters are tested in 1958 and later proven on the X-15 as a way to control a vehicle in the absence of dynamic pressure. The center’s initial focus was aeronautics, but the X-15 bridged the worlds of high speed aircraft with the research needed to reach beyond Earth’s atmosphere. The development of reaction control systems for the legendary X-15 was critical for spaceflight, as it provided a way to control a vehicle in the absence of dynamic pressure as is encountered in space. The Lunar Landing Research Vehicle also was tested here. After the aircraft that simulated flight of the one-sixth gravity of Earth that astronauts would face on the moon. The research contributed to construction of the Lunar Landing Training Vehicles that were built and sent to NASA Johnson Space Center in Houston (then called the Manned Spaceflight Center). Apollo astronauts used the spindly aircraft to train for landing on the moon. The practice was helpful when Neil Armstrong piloted the Lunar Module manually to the lunar surface to take the first steps. Lifting body aircraft were designed to validate the shape of a space return vehicle that could land like an aircraft instead of descending under a parachute and landing in the ocean. When the Sierra Nevada Corporation’s Dream Chaser spacecraft returns for additional approach and landing tests at Armstrong in 2017, it will continue the center’s historic role with lifting body shaped vehicles. Space Shuttle Enterprise’s approach and landing tests marked another contribution to space-related technology. A large steel gantry called the Mate Demate Device slowly lifted the shuttle onto the back of a specially modified NASA 747 Shuttle Carrier Aircraft. Enterprise was then launched from the back of the large aircraft to confirm shuttles could safely land unpowered. The center retained a role with the space shuttles during the 30-year program, often hosting landings. Most early landings and first flights of new orbiters or return to flight operations took place at the center. The shuttles concluded 54 space missions with a landing at Edwards and a return trip on the NASA 747 to Kennedy Space Center in Florida. 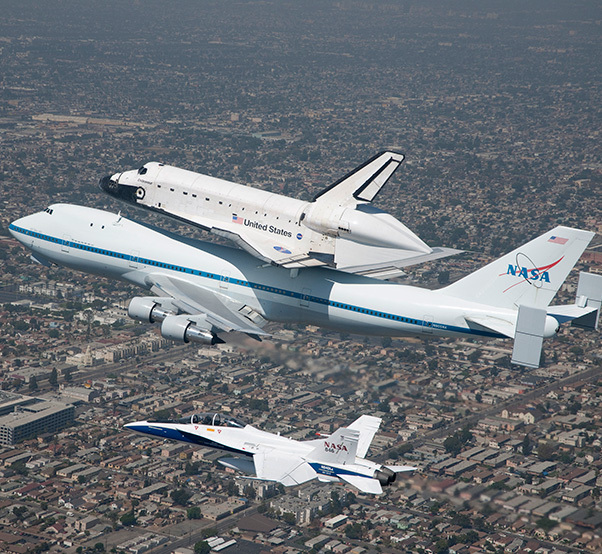 Space Shuttle Endeavour is affixed atop NASA’s 747 Shuttle Carrier Aircraft as it prepares for a landing at Los Angeles International Airport to conclude a final flight on Sept. 21, 2012. Also of consequence of the space program, Armstrong was involved in testing the pad launch abort test capsule for NASA’s Orion spacecraft, which is intended to eventually take astronauts on a journey to Mars. The capsule’s instrumentation and wiring took place at the center, as did its weight and balance, center of gravity and combined systems testing. The center also led the construction of the launch site at White Sands Missile Range in New Mexico where the capsule successfully launched May 6, 2010. Software for the agency’s Space Launch System rocket, which will launch Orion into deep space, was tested onboard Armstrong’s F-18 aircraft that flew nearly vertical to simulate a rocket flight path. An Armstrong F-18 was also used to test a radar system that helped land the Mars Curiosity rover on the surface of the planet in 2012. In fact, Armstrong manages the Space Technology Mission Directorate’s Flight Opportunities program, which seeks to mature space technology development through flights on commercial suborbital launch vehicles. The program funds the flights in space-like environments of new technologies of interest to NASA’s space exploration goals. Among other successes, the program has matured a 3-D printer is now on the International Space Station that can print parts and tools. Speed isn’t only the regime of space vehicles. Armstrong researchers explored the realm of hypersonic speed with the first integrated hypersonic scramjet engine, the X-43. The air-breathing engines propelled the vehicle to speeds of Mach 7, about 4,500 mph, and nearly to Mach 10, or roughly 6,500 mph, during separate flights in 2004. 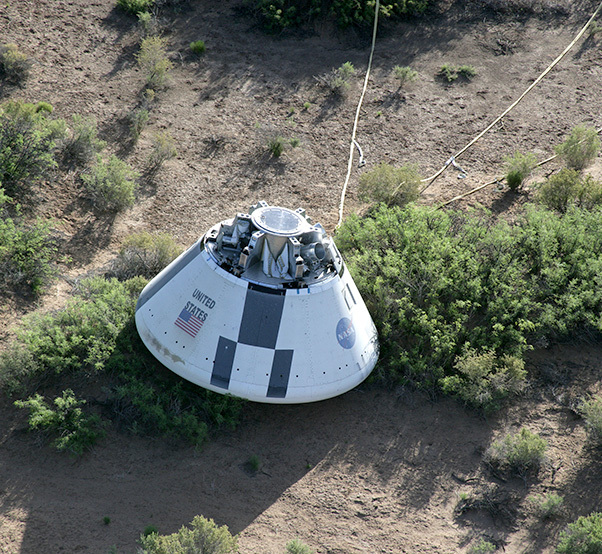 The undamaged Pad Abort-1 flight test crew module rested in the desert after a successful flight test May 6, 2010, at the White Sands Missile Range in New Mexico. A defining feature of all supersonic aircraft is a loud sonic boom created when an aircraft exceeds the speed of sound. Over the years NASA researchers have worked to mitigate or soften these booms, modifying aircraft to test theories and new technologies. Seven decades after helping to create the first sonic boom, NASA is designing a new X-plane to demonstrate quiet boom capabilities, which could lead to supersonic flight without startling people on the ground, a key hurdle to amending rules that currently prohibit overland supersonic operations. The preliminary design review for the Quiet Supersonic Transport human-piloted X-plane is currently underway. Unmanned Aircraft Systems, or UASs, are another major area that the center has researched with experimental vehicles since the 1960s. Engineers have continued to investigate this area of aeronautics including shapes and subsystems. Armstrong and other NASA centers remain involved in the technology development of UAS to help in the eventual integration of Unmanned Aircraft Systems into the National Airspace System. In the early 1990s Armstrong managed the Environmental Research Aircraft and Sensor Technology program with industry partners. 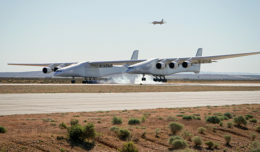 The idea was to develop emerging environmentally friendly aircraft, sensors and technologies needed to fly the emerging class of aircraft safely and conduct science missions. The solar-powered Helios reached an altitude of 96,863 feet altitude during the program. Prototypes of the Predator-B aircraft later led to the NASA science platform named Ikhana, which is now used for science and aeronautical missions. 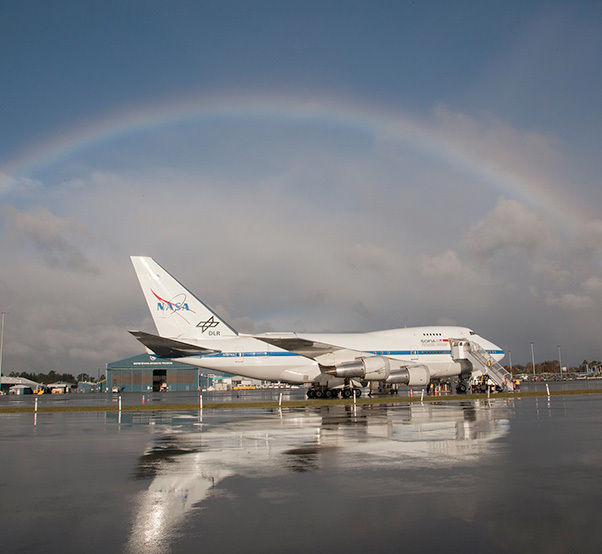 A rainbow frames the Stratospheric Observatory for Infrared Astronomy 747SP during its first Southern Hemisphere deployment in Christchurch, New Zealand, in July 2013. 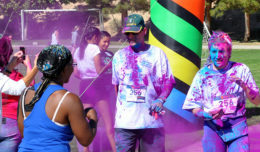 Sometimes technology advancements lead to revolutions in the way challenges are approached. For example, a specially-modified F-8 aircraft flown at Armstrong validated digital fly-by-wire control technology that replaced hydraulic systems. Military and commercial aviation companies subsequently integrated the systems into its aircraft. More recently, cars, motorcycles and boats are using systems with origins based in that research. 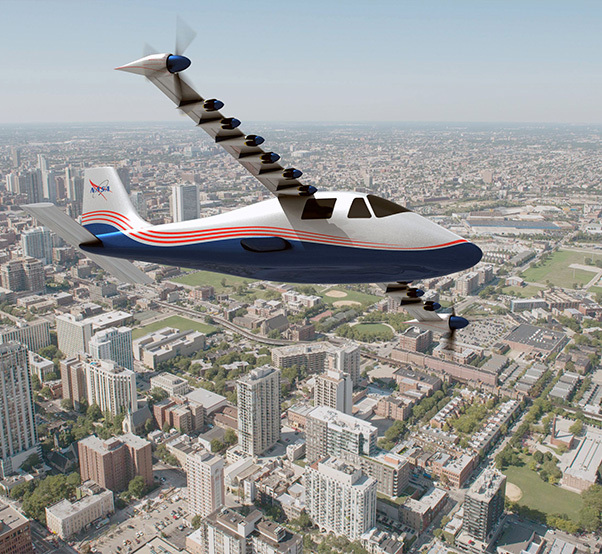 With an eye toward making aircraft technologies transferrable to commercial uses, the NASA Aeronautics Mission Directorate is planning to make it common for future aircraft to be more fuel efficient, quieter and produce fewer emissions. An example is the all-electric X-57 Maxwell X-plane intended to be high-efficiency, while reducing noise and emissions. The center doesn’t fly airplanes only for aeronautics research. Specially modified aircraft based at Armstrong support NASA’s Airborne Science Program, flying scientists and specialized instruments around the world to study Earth and its changing environment. This includes a DC-8 flying laboratory, a C-20A aircraft, two ER-2 high-altitude aircraft and two Global Hawks. NASA Langley/Advanced Concepts Lab, AMA Inc.
An artist’s concept of NASA’s X-57 Maxwell aircraft shows the plane’s specially designed wing and electric motors. The X-57 is intended to demonstrate that electric propulsion can make planes quieter and more efficient and environmentally friendly. Armstrong also operates and maintains the Stratospheric Observatory for Infrared Astronomy, or SOFIA. The NASA a 747SP has the world’s largest airborne infrared telescope. It flies above most of the atmosphere’s water vapor, which limits Earth-bound telescope observations. The result is clearer images of the universe and the ability to use the latest science instruments to capture extraordinary astronomical data about the solar system and far beyond. It’s hard to predict how future aviation and space vehicles and their systems will evolve. However, it is certain that NASA Armstrong will build on its 70 years of success to validate the technologies that will drive exploration for a better tomorrow. Editor’s note: Leslie Williams, Christian Gelzer, Matt Kamlet and Mike Agnew contributed to this report.